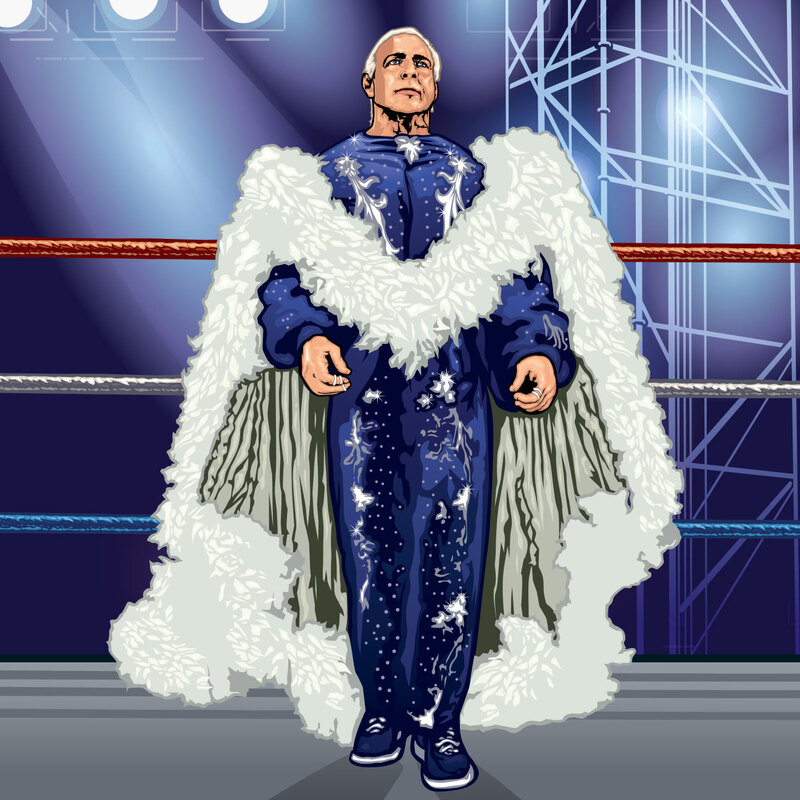 Ric Flair, the 16-time world champion -- the Rolex-wearing, diamond-ring-wearing, kiss-stealing, wheeling-dealing, limousine-riding, jet-flying son of a gun -- is an icon who transcended the world of wrestling and continues to make an impact on pop culture. The persona and the real man are hard to separate, which is clear to see in the upcoming 30 for 30 "Nature Boy", which debuts Tuesday night on ESPN at 10 p.m. ET. 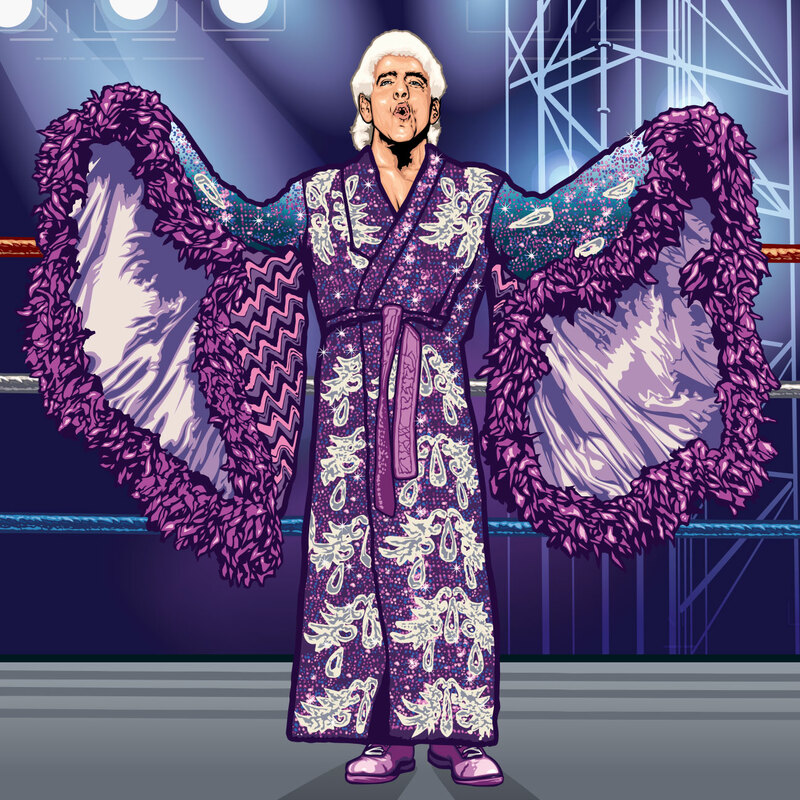 He lived an opulent life both inside and outside of the ring, and one of the most iconic elements of Flair's larger than life presentation were the wide variety of custom-made robes he wore to the ring, with trunks and knee pads to match. 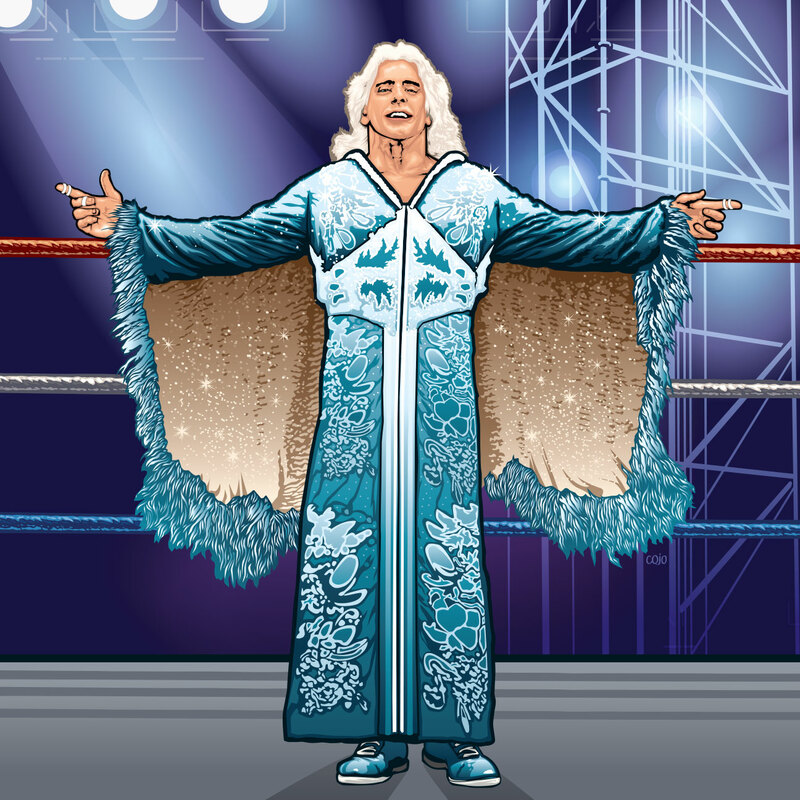 There were dozens of robes in Flair's collection at various points in his career, but we've zeroed in on seven particular looks from a variety of eras in Flair's career. They represent a cross-section of his biggest moments, and most memorable looks -- each one vastly different from the other, and evidence of just how big Flair went with everything he did in life. Worn at the inaugural Starrcade event, which was also called 'A Flair for the Gold', on Nov. 24, 1983 in Greensboro, North Carolina. Flair competed as the challenger in a steel cage match for the NWA world heavyweight championship against champion Harley Race. If the genesis of WrestleMania is inevitably linked to Hulk Hogan and the part he played in establishing the event in its first few years, Starrcade is the event that Ric Flair built. A year-and-a-half before the then-WWF produced Vince McMahon's vision for the biggest wrestling spectacle in the world, Starrcade was the NWA and Jim Crockett Promotions' effort to create a spectacle and a showcase for their top performers. On the night of Thanksgiving in 1983, Flair headlined the super-show at the Greensboro Coliseum against NWA champion Harley Race inside of a steel cage, and former NWA champion Gene Kiniski served as special guest referee. The NWA spared no expense, with his iconic entrance theme blaring, a light show, a giant disco ball, pyrotechnics and a smoke machine for Flair's dramatic entrance. If that didn't make it clear that he was the star attraction of the evening, Starrcade '83 was also branded, "A Flair for the Gold." As venues all over the southern United States watched on closed circuit, as did an announced live crowd of 16,000 in attendance, Flair defeated Race despite being bloodied, and began his second run as NWA champion. The light blue robe he wore for this iconic moment in his career was also, coincidentally or not, the robe Flair wore on Sept. 17, 1981 when he defeated Dusty Rhodes to win his first NWA championship in Kansas City, Kan. Worn at Battle of the Belts II on Feb. 14, 1986 in Orlando, Florida. The match was for the NWA heavyweigh championship, with Ric Flair defending his title against Barry Windham. 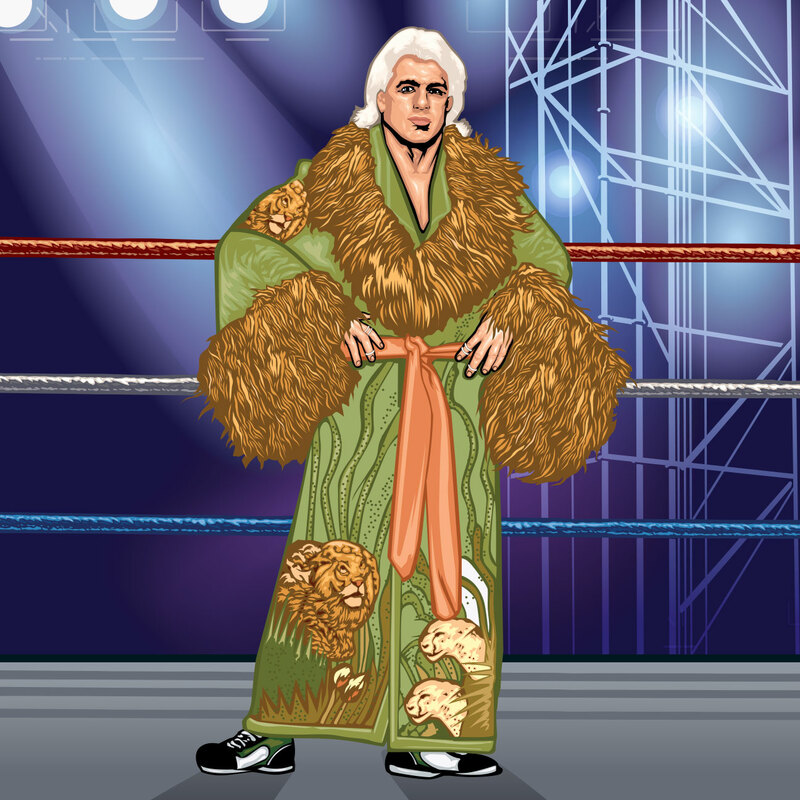 Most of Ric Flair's iconic robes had recognizable, repeated patterns, but he also wore a few outliers that go beyond even the standard level of Flair bombast. He had a few different animal-themed robes in green, but the most outlandish and instantly recognizable look of that bunch featured lions on the front and sleeves of the robe -- and an appropriately tan-shaded fur lining to the collar and sleeves to match. The most famous instance of Flair wearing this robe was a milestone match in a series against future Four Horsemen compatriot Barry Windham for NWA territory Championship Wrestling from Florida. In what was ultimately recognized as Wrestling Observer's best match of 1986, and the first Flair match to receive its "5-star"-match designation (on a scale of 0 to 5), Flair and Windham battled for more than 40 minutes before the match ended in a double countout. They'd face off again in April 1987 at the Crockett Cup in Baltimore, with Flair picking up the pinfall victory in another "5-star" match. Worn on Jan. 19, 1992 in Albany, New York. The Rumble match would crown the WWF champion. 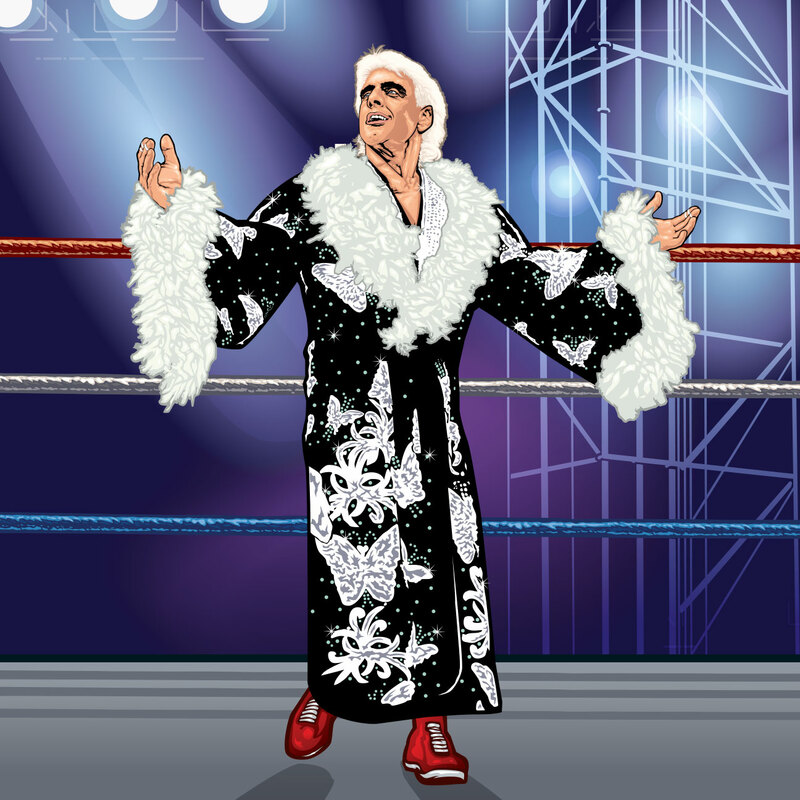 There are a few robes that pop up over and over again in Ric Flair's career, and the black-and-white robe that Flair wore for the bulk of his then-WWF run from 1991 to 1993 certainly ranks among the most recognizable. Flair's performance in the 1992 Royal Rumble match is instantly memorable for any number of reasons, and it all started with the dramatic camera view that took viewers from the end of a long walkway and zoomed toward Flair in the blink of an eye. Flanked by Mr. Perfect, Flair entered at No. 3 and went face-to-face with the British Bulldog before the ring started to fill up. He'd be in the ring for an hour, in a match where only one other competitor (Roddy Piper) lasted even half that much time. With an unexpected assist from Hulk Hogan in the closing moments of the match, Flair dumped Sid Justice out of the ring and ended any doubts about who the "real world's champion" was. The post-match promo, with "Mean" Gene Okerlund joined by Flair, Mr. Perfect and Bobby Heenan, made Flair's victory all the more iconic. This robe would return for a number of other big moments in Flair's career (although several were big losses) including the match in which he lost the WWF title to Bret Hart (October 1992), his loss in a loser leaves WWF match against Mr. Perfect (January 1993) and Flair's steel cage match against Hulk Hogan at WCW's Halloween Havoc in 1994. Worn on March 30, 2008 in Orlando, Florida. Ric Flair faced Shawn Michaels in a match where if he lost, he'd retire. If you were to script an ending to an in-ring career that spanned the bulk of four decades, you couldn't do much better than the exit WWE gave Ric Flair in 2008. And as he walked down the extra-long ramp toward the ring for his final match in WWE, he had to have an over-the-top robe entrance. The deep blue-colored robe, lined in white feathers, seamlessly embodied several of Flair's most iconic looks all rolled into one. Most notably, the silver lining that glistened in the bright lights shining down in the Citrus Bowl as he spread his arms out wide evoked memories of the blue robe that he'd worn some 25 years earlier. There was a full fireworks display as Flair walked down to the ring to take on his friend, Shawn Michaels. Flair's final match in the WWE was the culmination of several months of buildup. In late 2007, Vince McMahon issued an edict that the next time Flair lost a match, his career would be over. Flair survived matches with Triple H, Randy Orton, Umaga, William Regal and even McMahon himself, leading up to this showcase match against "Mr. WrestleMania" himself. Everyone remembers the tearful ending, as Michaels mouthed, "I'm sorry, I love you" before superkicking Flair and ending his illustrious career. Flair embraced his family, waved goodbye one final time, and stepped out of a WWE ring as an active competitor for the final time. For those in attendance, and the millions watching at home, everyone had a tear in their eye as they bid Flair farewell. Worn on April 5, 1992 in Indianapolis. The match featured Ric Flair defending his WWF championship against the "Macho Man" Randy Savage. It might be a little hard to believe, but Ric Flair had a grand total of one WWF championship match at WrestleMania in his career. 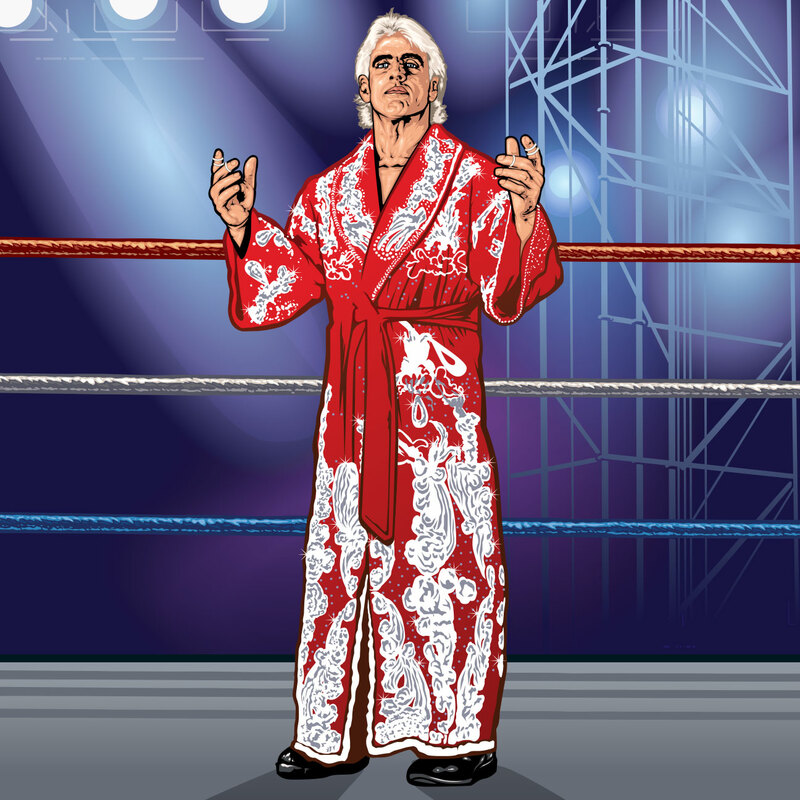 A lot of that can be attributed to the fact that this was the only WrestleMania to fall within Flair's original run with the company, but in this lone appearance, Flair made another look famous -- a red-and-white robe that made such an impact that it ultimately became the WWE's officially branded Halloween look. Three months after Flair had won the title at the Royal Rumble, Savage brought that first reign to an end and avenged months of Flair implying he'd had a relationship with Savage's wife, Ms. Elizabeth. This was a solid match, and the rivalry would carry on well into the fall, but the biggest question surrounding this particular event was why it was Savage, and not Hulk Hogan, challenging Flair for the title. With an opportunity to pit the singular icons of WCW and WWF while both were still near the peak of their powers, lukewarm reactions to house show matches between Flair and Hogan scared the creative team enough that plans were changed to Flair versus Savage and Hogan versus Sid. Fans would have to wait another two years, with Flair and Hogan both in WCW, for their first televised match. Worn on Feb. 25, 1990 in Greensboro, North Carolina. Flair defended his NWA championship against Lex Luger. Pink was a color that Flair returned to a number of times, with at least four different robes containing various shades of the color long before it was popular in pop culture. The pink look that seemed to pop up most often was Flair's light pink robe with a magenta flower pattern, although it doesn't appear as though he ever wore it for a major WWE match (despite 8x10s and promo photos for the 1991 Survivor Series that show him wearing it). This robe dates at least to 1988, when he tagged with Barry Windham to take on the Midnight Express at Clash of the Champions IV, and he was still wearing it for Bash at the Beach in WCW in 1995 and 1996. But the moment that stands out for Flair in this robe came in 1990, when he defended the NWA championship against Lex Luger. Luger, who stepped up and took Sting's spot after he got injured, had one of the best matches of his career opposite Flair -- and that's no coincidence. After almost 40 minutes, Luger had Flair up in the Human Torture Rack, seemingly locking up the title victory, but Arn and Ole Anderson attacked Sting at ringside. Luger, in an attempt to help, got himself counted out. They'd have a handful of other matches, and though Luger would never become NWA champion, this match helped put him on the path to becoming the second WCW champion after Flair left for the WWF. Worn at a taping in Hershey, Pennsylvania, and aired Sept. 14, 1992. Flair was the challenger in a WWF championship match facing champion "Macho Man" Randy Savage. There were a few years in the mid-90s, after Flair returned to WCW, during which Flair turned to his dark purple robe several times for big matches. The first was his return to Starrcade and his first post-WWF reign as WCW champion. He brought it back out for Bash at the Beach 1994 and his first televised match against Hulk Hogan. He even wore it to the ring for his match against Antonio Inoki during an infamous supershow held in North Korea. But there was also one particular match in WWF, one largely forgotten in the annals of the company's history, when Flair regained the WWF championship from Randy Savage during a taping of Prime Time Wrestling. Savage, who had come out of retirement and defeated Flair to win the title at WrestleMania VIII, lost the title in a match that didn't air until two weeks after it was filmed. Flair, who only had a few months left in WWF, would himself later lose the title to Bret Hart under similarly low-key circumstances, during a WWF Coliseum Video-exclusive match in Saskatoon, Saskatchewan, just over one month later. The most low-key world title run out of Flair's 16 career reigns came and went fairly quietly, but as he did for the bulk of his career, he made his entrance another part of the allure and the mystique that made Flair a wrestling icon.